I’m tempted to write another hate diatribe rant about The King’s Speech not deserving its Best Picture Oscar for 2010, but I already did that in my Social Network review. However, as I look at the list of the rest of the Best Picture nominees for that year – this movie among them – I realise that of the ten movies nominated, I would put King’s Speech at number ten. I put the lesbian family dramedy The Kids Are All Right at nine, and I don’t believe that deserved a Best Picture nom either. SPOILER ALERT the rest of the nominees I would most likely rate as 4.5 – 5 star movies, including this one. First of all, I’m an unabashed Coen Brothers fan, and as a film snob, that’s probably expected of me. However, sometimes I have a contrary opinion to that of other film snobs (I think Stanley Kubrick was boring/overrated, same for Terence Malick, Martin Scorcese is hit or miss with me, etc.) so I just wanted to make it clear beforehand that I love the films of Ethan and Joel Coen. Even the least praised ones are worthy of a watch, and damn anyone who tells you otherwise. I still haven’t seen the original John Wayne version of True Grit (nor have I ever seen a single John Wayne movie), so I can’t comment on how they compare, nor should that matter. There is nothing that could enhance my watching of this movie, as it is already a high quality story, a gorgeously made Western, and a well-acted film. 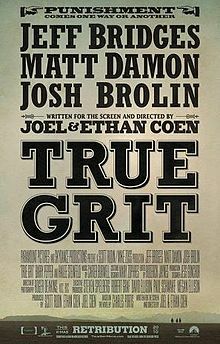 It’s got it all, dark humour, drama, tension, aside from being a Western, it’s pretty much a Coen Brothers movie. The acting is all around great, from the well-deserved Best Actor nomination for Jeff Bridges, to the talented newcomer, Hailee Steinfeld. Just an excellent all around movie and worthy of multiple viewings in my opinion.